(CNN) - "The Shape of Water" floated to the top as best picture at the 90th annual Academy Awards, bringing a suspenseful close to an awards season punctuated by the sexual-harassment scandals that have roiled Hollywood. The Oscars are a big, unwieldy beast, which invariably try to serve too many masters. Yet if the intent was ultimately to maintain a celebratory tone without ignoring either the outside world or the elephant in the room throughout this year's awards, host Jimmy Kimmel and the show itself largely succeeded. Aside from best picture, the awards both spread the wealth among a number of films and mostly followed the anticipated script, with few major surprises among the highest-profile categories. The show also managed to deal with serious issues -- from Time's Up to diversity and inclusion -- without sacrificing a sense of fun and irreverence. Last year, the two-month awards process was dominated by the collective response to the newly minted Trump administration. While politics played a significant part in Sunday's telecast, there was also the matter of the #MeToo movement, as the entertainment industry still seeks to get its own house in order. Kimmel addressed the #MeToo movement and Time's Up campaign head-on in his opening monologue, which mocked various targets -- including, inevitably, the Trump White House -- with a light, clever touch. Indeed, while Kimmel might have become a more polarizing figure with his entry into the healthcare and gun-control debates, he again brought a genial persona to the emcee role, one that somewhat leavened the seriousness and bouts of pretentiousness that can drip into the ceremony. The host also again enlisted ordinary people into the act -- this time taking a group of stars to surprise the audience in a nearby theater. As with last year's similar stunt, the idea was better than the execution, but it did give the show a welcome and refreshing jolt of energy. In terms of politics, Kimmel extended an endorsement to the planned march for gun control being organized by students impacted by the Parkland school shooting. When the documentary "Icarus," about a Russian whistleblower, won, he deadpanned, "Now we know at least [Vladimir] Putin didn't rig this competition." The audience also loudly cheered acknowledgment of the Dreamers, those youths brought to America without legal documentation; "Coco," the animated feature, whose producers gave thanks to Mexico, where the story takes place; and Common's passionate rap, which took President Trump to task on multiple fronts. Director Guillermo del Toro also spoke of the power of film to tear down walls, not erect them. The issue of sexual harassment was given powerful voice by several actresses who have publicly spoken out about disgraced producer Harvey Weinstein, allegations that, because of his outsized role, cast a shadow over awards season. Ashley Judd cited "a mighty chorus that is finally saying Time's Up." Frances McDormand also used her speech to deliver a message of female empowerment, having all the women nominees stand -- a symbolic gesture if there ever was one. 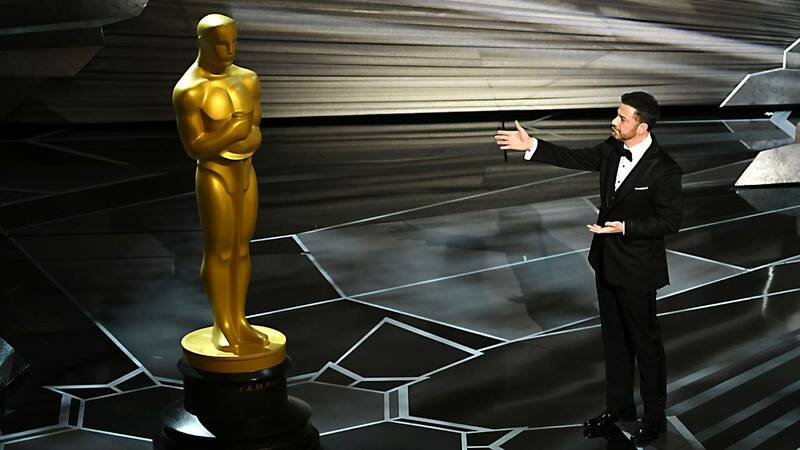 For an event like the Oscars, avoiding major snafus is always part of the challenge, especially after last year's envelope mix-up. Bringing back Warren Beatty and Faye Dunaway as presenters nicely added closure to that farcical finale. The producers also provided the requisite mix of old and new, featuring the stars of superhero fare like "Black Panther" and "Wonder Woman" while giving nostalgic nods to Eva Marie Saint, Rita Moreno and Jane Fonda. Throw in screenplay winner James Ivory, 89, and for an industry that prize's youth, it was an inordinately good night for octogenarians.